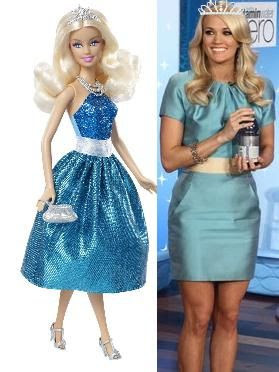 Carrie Underwood was on Ellen last week and I know I say this all the time, but it's about time we got some proof that she looks like a Barbie. As soon as she came out, she had a blue, shiny dress that screamed Barbie. It fit her perfectly, and her body looked flawless. In case you were wondering, it didn't take me long to find her Barbie lookalike. She. Is. Gorgeous! I can't wait to see what fame does for Pia Toscano because I don't think she's PERFECT now, but I didn't think Carrie was back then, either. Anyway, she talked about married life, her dogs, and Soul Surfer, her first movie! But most importantly, she admitted that her hubby is a hoarder. Can I just be her now? Please? Hott husband, awesome life, awesome look... Hmph. PS: For those of you who say I'm jealous of all the people I hate on, I think this is proof that the people I'm jealous of are the people I want to be... and I'll tell you straight up.